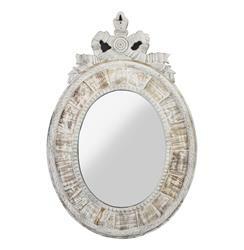 This stunning, elaborately carved oval mirror would be fabulous in a bedroom, hallway or living room. Sectioned wheel like carvings circle the wall mirror and an ornate bow-shaped ribbon of white washed oak neatly decorates the top. A most feminine accent.